A few log cabins from pre-park settlement days still dot the Smokies’ landscape. Most old homesteads have been removed or weathered away. Those that survive are maintained by the National Park Service as important cultural sites in the mountains. 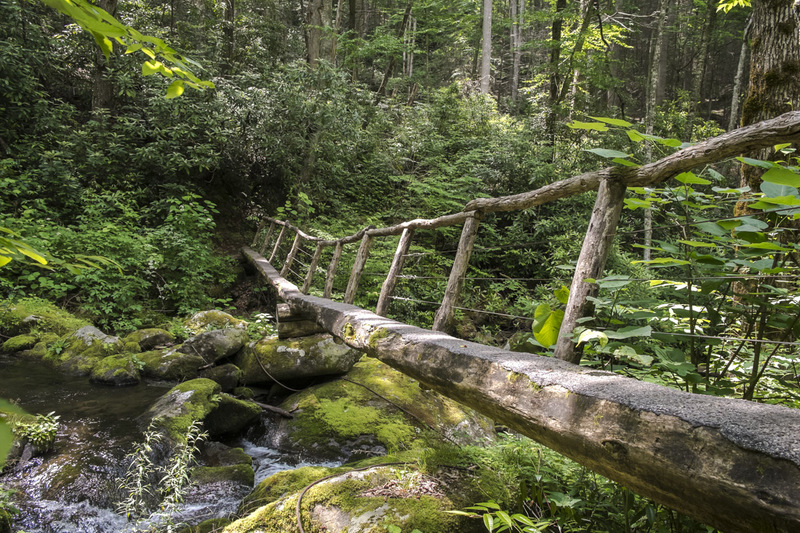 Hiking Trails of the Smokies and other books devoted to the park’s log cabins and historic buildings detail many of these structures, their architecture and owners. These publications consistently ignore one maintained cabin, and despite its hidden location well off an established trail, this home continues to attract numerous visitors. 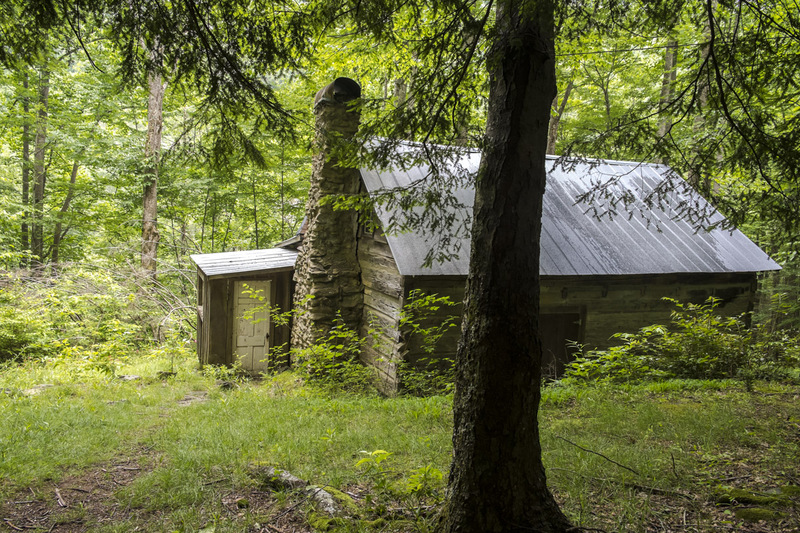 A peek at the Avent Cabin near Jakes Creek has eluded me on two other treks along that trail and remained an itch I need to scratch. The opportunity comes June 18 during a short park visit. The half-park National Geographic map for Cades Cove and Elkmont, pinpoints the cabin’s location on the right side of Jakes Creek Trail across the creek. Not realizing it was that far off trail, it’s little wonder I hadn’t seen it while hiking. Today I will focus on finding the approach path. Jakes Creek Trail begins at the paved parking lot next to Daisy Town cabins being stabilized in Elkmont and ascends the old road past deteriorating cabins of Society Hill. Their conditions have worsened noticeably since my visit in June 2011. Those with metal standing seam roofs have faired much better than the cabins with shingle roofing. The latter show significant collapse. Even the caution tape in front of them sags to the ground. At 0.4 mile the gravel road trail forks left, climbs another 0.3 mile to Cucumber Gap Trail junction, then 0.1 mile more to Meigs Creek Trail. 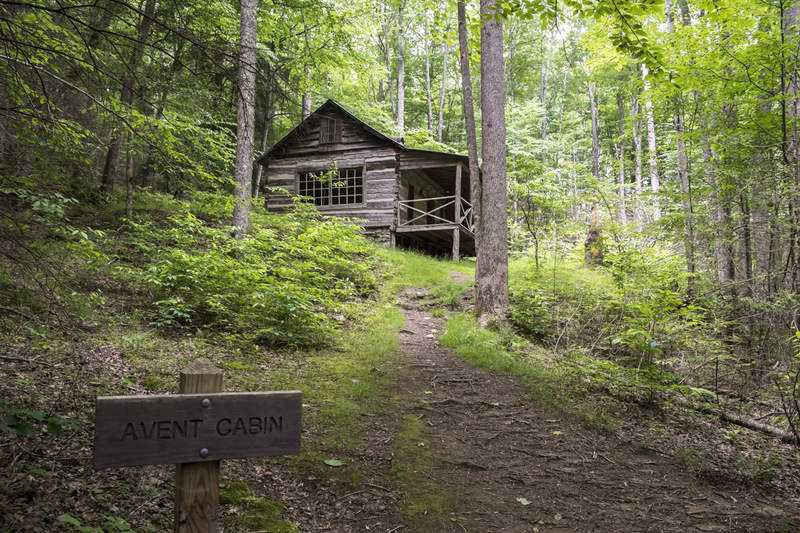 The Avent Cabin path is about a quarter mile or so past the Meigs Creek trailhead. Even in the fullness of June, the path is fairly easy to spot. Log steps descend the steep road bank, and the path winds down past a mucky spot to a long, narrow footlog over Jakes Creek. On the other side of the bridge, the path mingles with a wet spring for a few yards and climbs rather steeply to the cabin. The entire approach path is perhaps 0.15 mile. Staring up at the cabin, I am struck by its good condition, raised porch, and expansive side window. The site seems near idyllic, nestled in the flowing skirts of Blanket Mountain. Forget the Elkmont summer homes at the trailhead. Even in their prime, they would be hard pressed to touch the simple grace and charm of this cabin, and none could offer its quiet and privacy. I could be quite happy here! There is a definite air about this cabin…it’s not your typical Smoky Mountain homestead. A series of pleasant discoveries await. Built around 1845 by Humphrey Ownby, the cabin remained in the family until 1918 when purchased (along with 18.5 acres) by Frank Avent. The National Park Service acquired the property in 1932 giving the Avent family a lifetime lease. Logging in Elkmont continued through the 1930s, orchards grew on the hillsides, and city families spent hot summers enjoying cool mountains in their little resort community as the forest gradually returned. In 1992, most of the Elkmont leases expired including the Avent’s, but this did little to ease the long-running battle over Elkmont. (See “Elkmont, June 20-25, 2011” July 2011 Archive). To thwart park demolition plans, numerous buildings were nominated to the National Register of Historic Places in 1994. The Avent Cabin tucked far up Jakes Creek was one of the these. NPS had no problem approving historic designation for this cabin. 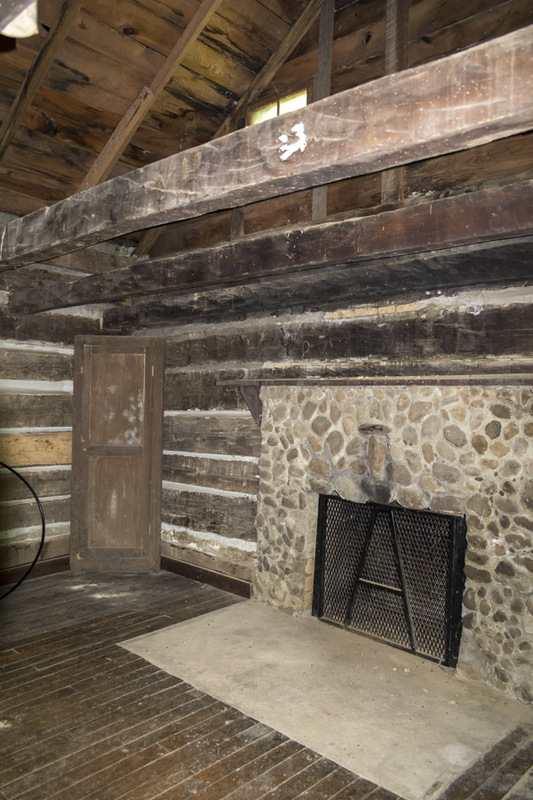 Not only was it one of the oldest log structures still extant, it was also the summer studio for a famous Tennessee artist, Mayna Treanor Avent, Frank’s wife. This is where things become fascinating for me. Mayna Treanor, was born in Nashville, TN, in 1868. Her parents lived at Tulip Grove, a Greek Revival mansion built in the 1830s by Andrew Jackson’s nephew one mile from Jackson’s home The Hermitage and now an official part of the preserved property associated with the seventh U.S. president. Mayna was a daughter of privilege and a talented visual artist. Her art studies included a two-year stint at the Academie Julien in Paris. 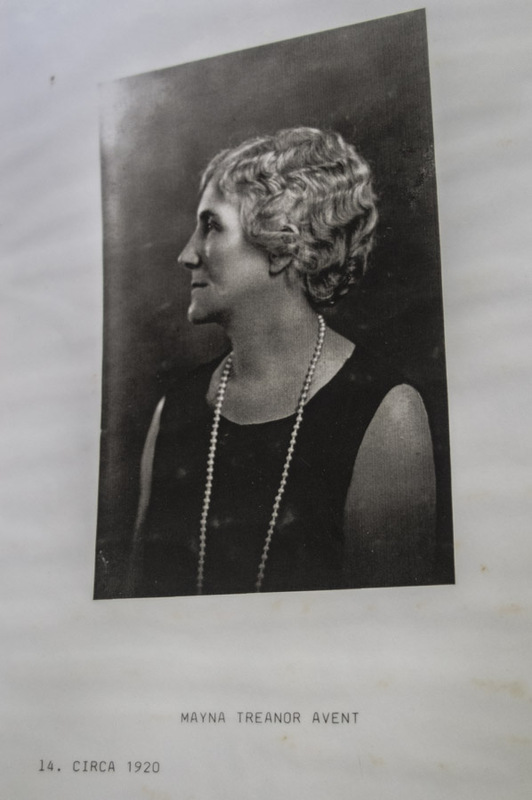 In 1891, she married Frank Avent, a well-connected Murfreesboro attorney who would serve as the state’s railroad commissioner for several years. Working primarily in oils and watercolors as well as wood block prints, Mayna taught painting in Nashville, exhibited her art throughout the country, and was an active member in the Nashville Artists Guild among other organizations. Her portrait of James K. Polk is in the Smithsonian’s National Portrait Gallery. 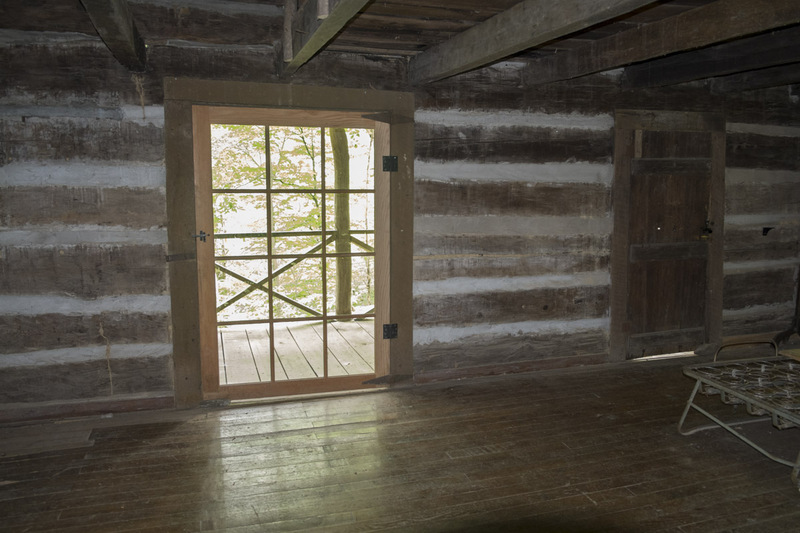 In the 1920’s, Mayna’s son James modified the recently acquired cabin on Jakes Creek adding an 8-foot-wide window on the southwest end to provide sufficient natural light for his mother’s work. The marvelous window was not the only remodeling work done. As I approach the cabin, I have no knowledge of this history, but many things immediately distinguish this structure from all the others I’ve seen. There is no external access to the raised porch and railing facing downslope. A stone path between the back of the cabin and a rock retaining wall leads to and beyond the central entrance. Thanks to the large window, natural light lends a spacious feel to the interior. There are three other windows — two in the eaves and one overlooking the porch — and a glass door to the porch. A solid wood door also accesses the porch. The mortared stone-and-brick fireplace with what looks like a concrete hearth commands one wall. After that amazing window, the most unique aspect of this cabin is the finished oak hardwood floor complete with baseboards. An angled ladder of steps leads to a half loft overlooking the main room. There are even a few furnishings — metal bed frames, an old wooden hatrack, and a builtin corner cupboard. An assortment of clean garden tools (rakes, a hoe) and brooms lean against the wall. Attached to the far end of the cabin and accessible from the porch and outside is what I had at first assumed might be a ‘stranger room.’ It is a tiny kitchen with two generously sized windows, sink, counter, cupboard, and old iron stove. A visitors’ register with pen hangs by the door nearly full of names, dates, and comments. 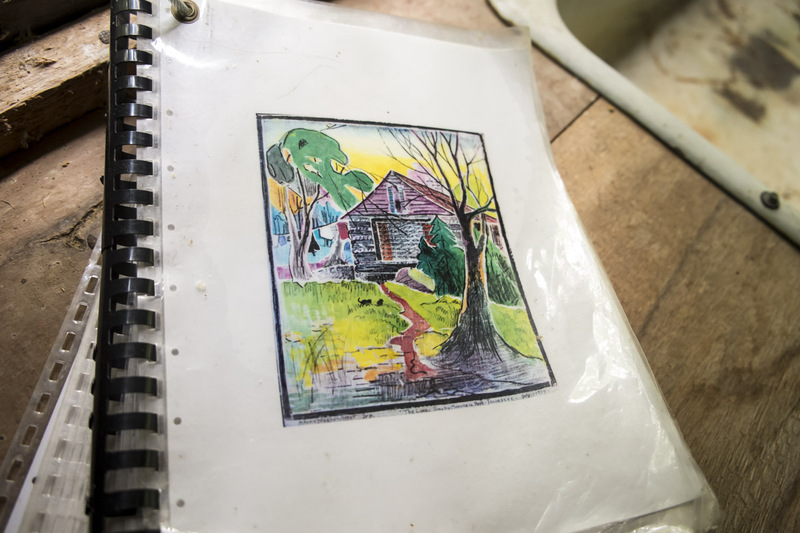 On the counter is a bound collection of documents including letters on the cabin’s historic place designation, intriguing pictures of the fully furnished interior, a photographic portrait of Mayna, and a floor plan. 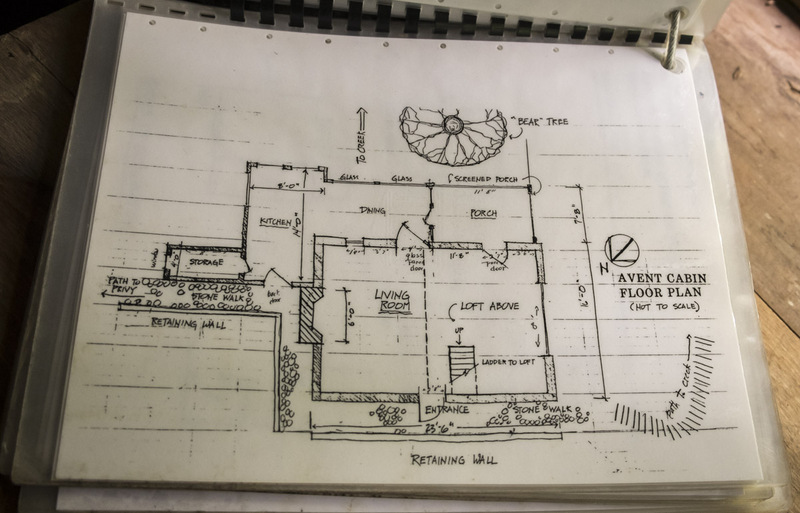 The floor plan shows that half the porch had been glassed in as a dining room connecting the main cabin to the kitchen via the glass door, and the rest of the porch was screened. There had been a small storage area off the kitchen, but it is now gone. The stone path across the entrance side of the cabin had continued around to the outer kitchen door, turned left and led to the privy. The plan also notes a large tree in front of the porch nicknamed the “bear tree.” It too is gone. 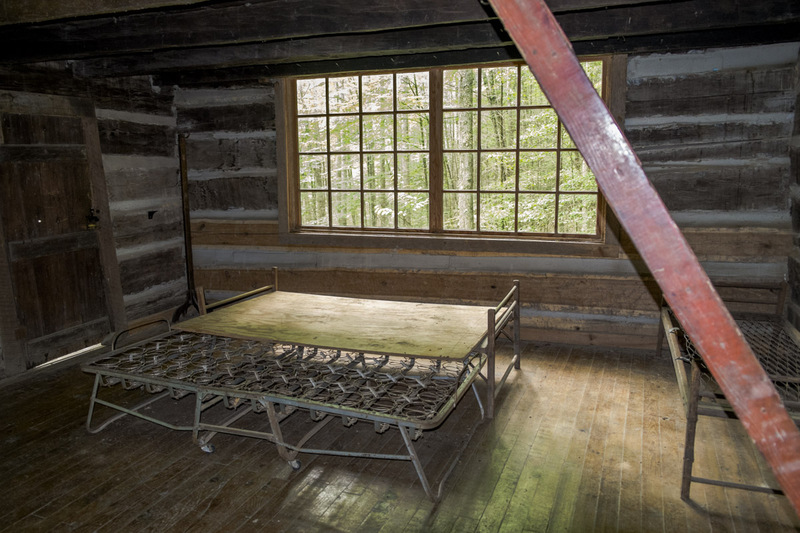 These renovations smoothed the ‘rough edges’ found in most preserved Smokies cabins. This must be why park books on historic structures don’t mention the Avent cabin. Mid-nineteenth century authenticity was compromised for early twentieth century comfort. 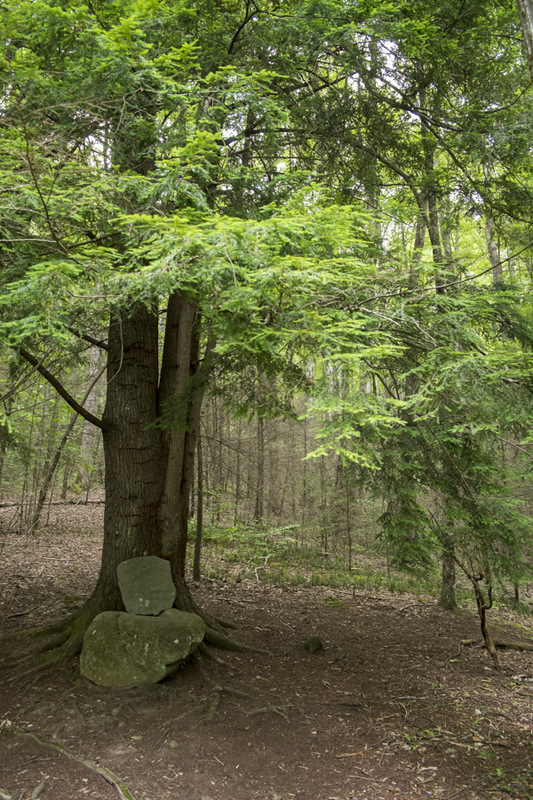 Following a dirt path up hill from the back kitchen door leads to a large, healthy hemlock whose roots cradle one large stone arranged with a smaller one into a makeshift chair. The view from this shady seat looks back toward the cabin as the sound of Jakes Creek downslope mingles with birdsong. What a pleasant place to sit. Flatbranch Ground Pine grows behind the tree. 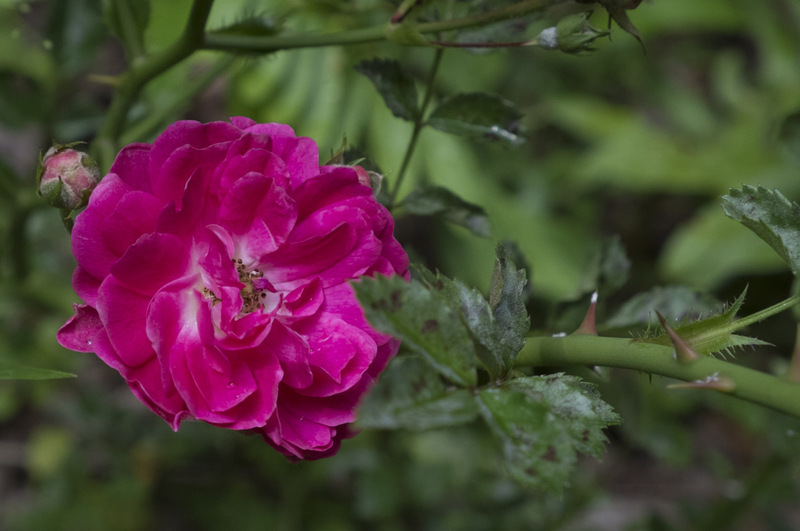 Near the kitchen, an old double rose cultivar sports flowers in a rich color Mayna must have loved. The bound collection of documents highlights one of Mayna’s signed watercolors on the cover — a brilliant hued rendering of “‘The Log Cabin’ Smoky Mountain Park, Tennessee, July 1934.” Vibrant turquoise, yellow, rose, and green surround the more subdued cabin. Two black kittens are playing in the grass. Mayna used the cabin as her mountain studio for 20 years. Images of some of Mayna’s other works can be found online, such as an oil still life of fruit and silver coffee pot in cool blues and turquoise, warm yellows and orange. Another of her watercolors traces pale blue and rose washes of jagged mountain peaks behind dense, dark foliage on a steep slope. It looks more Rocky Mountain than Smoky Mountain. Mayna died in 1959, her son in 1995. She was 90, he was nearly 100. In the debate of nurture versus nature, one must give genetics the first nod for such longevity. However, all that time amid a regenerating forest, breathing its fresh air, relaxing in its peace and serenity, may well have bolstered their genetic dispositions, and if not, it certainly made those years much more delightful. The links below provided some of the information for this article and include additional photos of the cabin plus a video tour.